John Dunning was born in 1852 in Leeds, Yorkshire, England, son of Jonathon Dunning and Mary Isherwood. He married Julia Coy, (1844-1909) at St Mark’s Church, Woodhouse, Leeds, Yorkshire, on 28 March 1874. There were six children; 3 sons and 4 daughters. 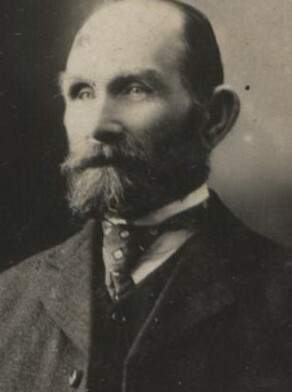 John Dunning together with his wife and children arrived at Sydney, NSW on 13 November 1882 as unassisted immigrants on the vessel ’Bann’. His stated occupation was bricklayer. John Dunning died on 8 June 1934 at Ramsgate, NSW, aged 83 years. He was buried with his wife in the Society of Friends Section (Quaker) at Rookwood Cemetery. John Dunning left a Will and his estate and assets were assessed at £1,821. He lived at Hansard Street, Waterloo. At the age of 20 years John Dunning enlisted with the Prince of Wales Regiment Dragoon Guards, and served with them for some years. John Dunning was a Freemason and a member of the Loyal Eureka Lodge No 53. A complimentary social was given to Dunning in the Waterloo Town Hall on 7 December 1910, by the residents and ratepayers, to mark their appreciation of his services rendered to the district and his friendship during the past twenty years. John Dunning was a justice of the peace (JP). John Dunning was an alderman on Waterloo Council in 1895-1900 and 1904-1910 representing South Ward. He was mayor in 1909-10. His son Albert Dunning also served on Waterloo Council.